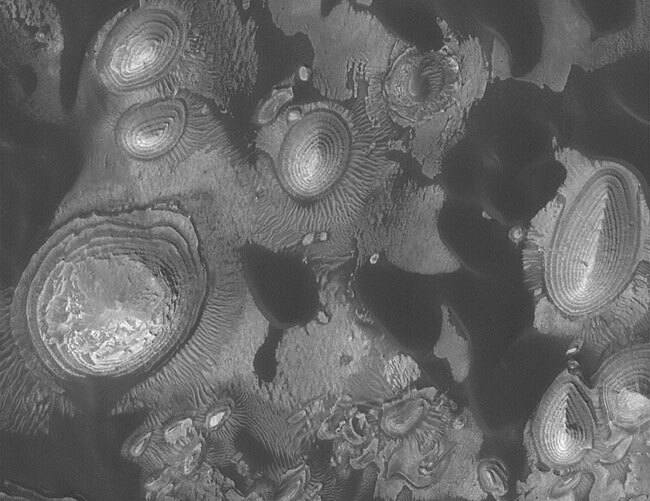 Explanation: Why are some hills on Mars so layered? The answer is still under investigation. Clearly, dark windblown sand surrounds outcropping of light sedimentary rock across the floor of crater Arabia Terra. The light rock clearly appears structured into many layers, the lowest of which is likely very old. Although the dark sand forms dunes, rippled dunes of lighter colored sand are easier to see surrounding the stepped mesas. Blown sand possibly itself eroded once-larger mesas into the layered hills. Most of the layered shelves are wide enough to drive a truck around. The above image, showing an area about 3 kilometers across, was taken in October by the Mars Global Surveyor spacecraft currently orbiting Mars. Tomorrow, the first of three robot spacecraft from Earth is scheduled to arrive at the red planet.